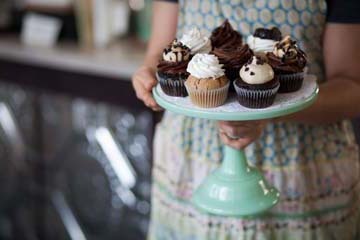 Jean Thompson, owner and CEO of Seattle Chocolate, drives web traffic and events with the help of Bing Ads intelligence. Headquartered in Tukwila, Washington, Seattle Chocolate serves as a testament to women-driven businesses and the company’s overwhelming female majority. “All the things that women bring to the table are a strong part of our culture: great communication, collaboration and support,” says Thompson. Thompson brings a unique background to her chocolate pedigree. Instead of having a resume filled with culinary pursuits, she comes from the world of high tech. After working her way up to corporate communications manager at Microsoft, she decided to switch things up in 1991 and try a new full-time gig: motherhood. It’s during that time in her life that she came across Seattle Chocolate. Formed in 1991, Seattle Chocolate debuted with little fanfare or publicity. Thompson, however, became a fan and then an investor. “I thought the company had a tremendous amount of potential,” she recalls. Sometimes in life, you have to let nature take its course. Thompson did, literally. In 2001, the Nisqually earthquake rocked Puget Sound, destroying one building in the process, which happened to be the home of Seattle Chocolate. Thompson quickly stepped in to finance the company’s move to another facility. By the time the project was completed, she had become the majority owner and CEO of the company. Using her savvy, passion and entrepreneurial spirit, she reimagined the company and its brand. She was recently nominated for the Kettle Award by the National Confectioners Association, the oldest such industry organisation in the country. Jean Thompson, owner and CEO at their Seattle Chocolate Factory. Thompson wanted to know why the company wasn’t marketing to women. “The whole industry markets chocolate to men,” points out Thompson. “Although men eat it as much as women do, chocolate for them is a gift. Women love to talk about and eat chocolate every day, and they buy it mostly for themselves. It’s also a perfect match for their metabolism." Throughout the years, Thompson started incorporating bright colors into the packaging design. “That's what pops off the shelf and draws in women's eyes,” Thompson adds. Today, Seattle Chocolate currently offers 26 different truffles, 16 bar types and a dozen different Frangos chocolates, a brand with a long Northwest history. For quality control, Thompson only sources the best ingredients. The chocolates are kosher, non-GMO and certified as Safe Quality Food. The beans are certified by the Rainforest Alliance. The whole industry markets chocolate to men. Although men eat it as much as women do, chocolate for them is a gift. Women love to talk about and eat chocolate every day, and they buy it mostly for themselves. It’s also a perfect match for their metabolism. 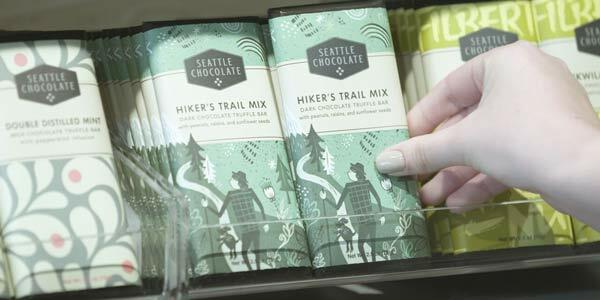 The Seattle Chocolate brand refresh includes new bars such as Hikers Trail Mix, embracing the Pacific Northwest. In May 2018, the company launched a brand refresh, which included updating the corporate logo, using local artist illustrations on its wrapping, and taking the company’s name to heart. “The Pacific Northwest and Seattle have become super hip, cool places, and people want us, with our name, to own that,” says Kirsty Ellison, director of marketing at Seattle Chocolate. This resulted in a new tagline: May chocolate be your umbrella. “We’re acknowledging that it rains here and laughing about it in our own way,” says Thompson. As much as she loves her products, Thompson wants her company’s legacy to be more than an indulgence. That’s why, in 2012, she started jcoco, a premium brand of solid chocolate bars for the foodie adventurer. Whereas Seattle Chocolate focuses on safer flavor combinations, jcoco pushes the flavor profile with ingredients such as toasted edamame beans or a combination of white chocolate, orange and cayenne pepper. The real story, however, comes from giving back. 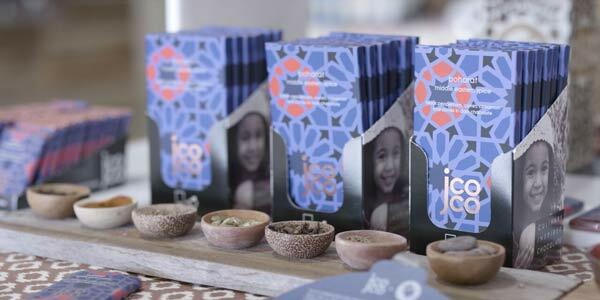 In 2012, Seattle Chocolate started jcoco, a premium brand of solid chocolate bars for the foodie adventurer. “Everybody always asks for chocolate at events and fundraisers,” says Thompson. “And we always say, ‘Yes.’ But it felt like we weren't really making a difference anywhere.” Thompson refocused her corporate giving efforts. “Chocolate is a food, and one in six Americans are food-challenged,” says Thompson. “While our food is nice to have, people are living without their lunch." 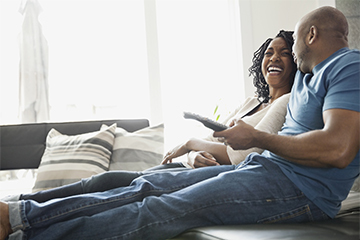 We’re passionate about supporting our community. Chocolate is one of the few foods where you share and commune around it. Why shouldn't we have the ability for neighbors to help neighbors by giving back? You’d think the path to success would go through major grocery chains. Thompson, however, found out that the competition for shelf space was tough. 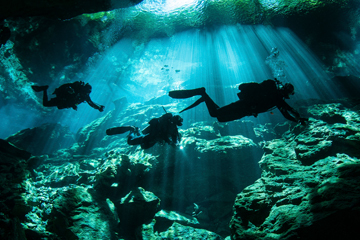 “We went big, going everywhere way too fast,” she recalls. “What we didn't realise is that we didn't have the brand yet that was really going to generate the pull off the shelf.” Over the last 10 years, Thompson re-strategised, targeting key retail locations and top doors. View or save the infographic to see how Seattle Chocolate used Bing Ads to increase brand recognition and drive traffic to its site.